Great update. Your writing is excellent. Do you have an idea as to where you would like your tactics to end up in the future? I.e. 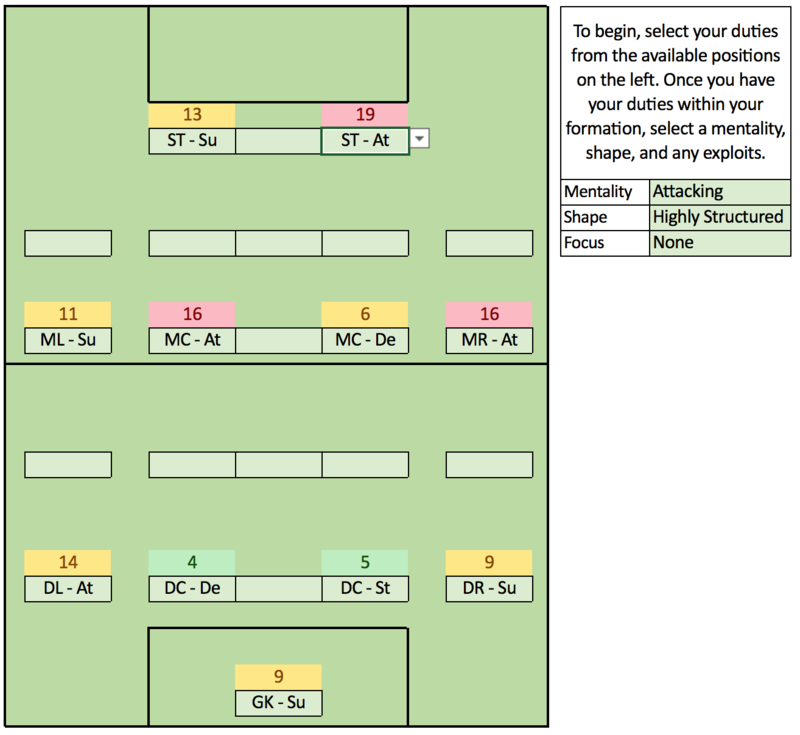 do you think you’re likely to stick with your current formations? Do you plan on going fluid and eventually very fluid when certain players have developed/been upgraded? I do have an idea, yes. However a lot depends on how players develop and how long we can afford to keep them. Something I wasn't aware of at the start was that Benfica have £164m in debt and are making interest only payments of £1.5m per month - sounds like they've taken a loan through wonga! - and means we run at a monthly deficit and we are hugely reliant on transfer income to stay afloat and meet the FFP rules. Having made so many sales and replacing with youth last year our wage costs were very low but even then we turned a monthly loss. This year the young players wages have doubled or even trebled - though still not massive - now they're established in the first team and bigger clubs are looking so I am expecting bigger losses. Assuming I still have players, the 4-1-4-1 certainly has potential. 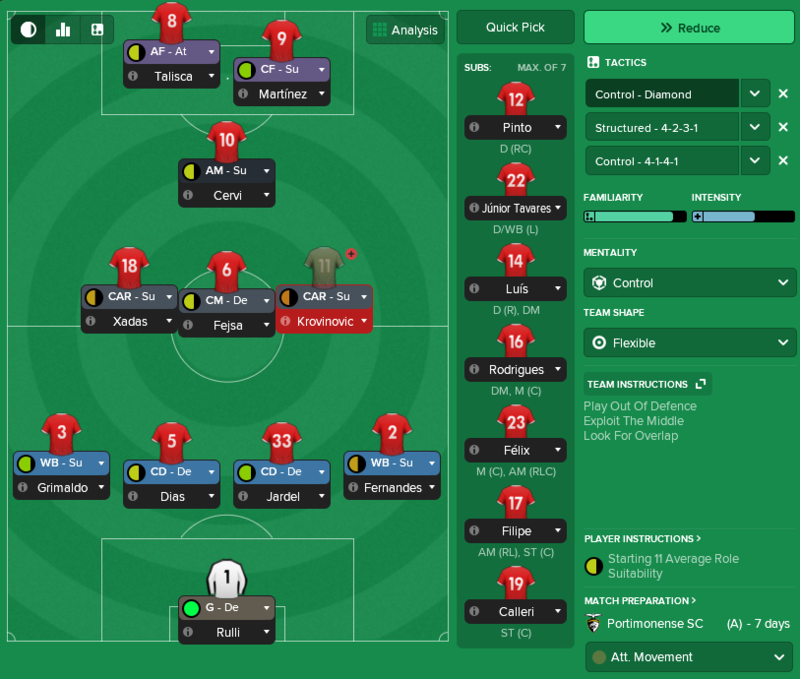 The diamond was for a specific purpose - covering a season with limited wingers and accommodating Talisca - which I think now has been achieved as Felipe and Trincão look ready and just agreed to sell Talisca to Monaco for £26.5m. Would you be interested in turning this into a traditional save (career updates page) at some point? But are you aiming to use more fluid shapes than flexible, once the talents have developed enough football intelligence? Or keep with flexible combined with the modifiers (using support duties only, exploit the middle shouts an so on)? Wow, I had no idea they were so far in the red. Have you tried reducing the % made available for transfers after you have sold a player? Have you made any changes to your original 4-1-4-1 i.e. roles or team instructions? To be honest I try and use the 4-1-4-1 for most saves as i think it is so flexible and solid. I just change the mentality depending on the opposition if I'm not an all conquering team. I also normally try and create a back 3 formation to counter the 4-4-2 etc. 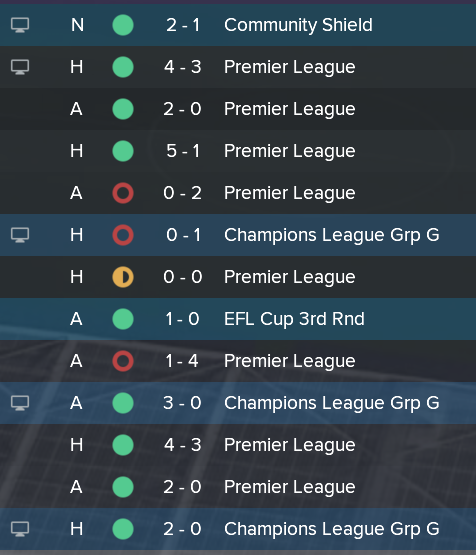 but have struggled to do this successfully on FM 18. I'm inspired to start a youth development save, similar to this, but am honestly struggling to think of a team with a decent amount of potential first team players, ideally in an English league. Yes, as attributes like anticipation, decisions, vision etc increase I would increase collective creative freedom - i.e. play a more fluid team shape. Looking at the Financial Fair Play rules, our expenses need to be less than €5m above our revenue over any 3-year period. In that case we are OK for the next 2-years whilst the large chunk of transfer revenue is within the 3-year period. For anyone in a similar position it seems I made two fairly sizeable mistakes. Selling so many players in the same financial year. Around £95m is going to meet the FFP requirements for the next 2-years. After that, it'll be outside the 3-year window and no longer counted towards my revenue. It'd have been much more efficient to either negotiate transfer fees spread over 2-3 years or to have staggered the sales. Not re-investing enough of the revenue. I could also have kept enough revenue to cover our costs for the year and re-invested the remaining revenue in players to develop and sell to generate future revenue. To add to the good news the UK has announced Brexit and all EU players now need a work permit to play in England. I guess this is why I am not an accountant! Tactics, I'm a bit more comfortable with. Yes, the 4-1-4-1 is still largely unchanged. England is tough. The Premier League is very unforgiving for young players. A Championship or League One club with a budget would be interesting, scavenging all the wasted talents unable to get game time at the top clubs. Around Europe, there's a few I've noticed - Benfica (obviously), Porto, Sporting, Lyon, Leverkusen and Dortmund have incredible talented young players it'd be fun to develop. Edited August 13, 2018 by Ö-zil to the Arsenal! I suppose player sales is a must then unless you manage to win something like the champions league (I assume that makes a difference). Yes, i find that too but i like the challenge and familiarity of the English leagues, although the academy's probably don't have as many prospects per team as teams you have mentioned. Perhaps Fluid/attacking with PI's: play out of defence, close down more and pass into space. What do you think to this? Attacking - or even Overload - works very well with Fluid or Very Fluid when balanced with Support & Defend duties. 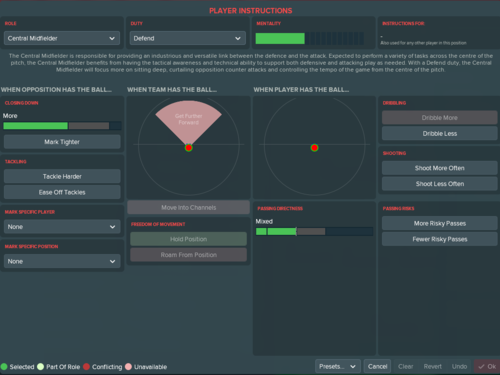 Possibly my favourite style of football in the match engine when it clicks. You mentioned earlier in the thread that midfield support roles gets an increase in mentality when there are no attacking duties. Just to clarify, does that mean no attacking duties at all in the team or just when there are no attack duties in midfield? No attack duties in the team. Always double check directly by looking at the mentality bar in the player instruction screen as there seem to be a number of caveats and I am not sure exactly what they are. So I've been shamelessly stealing @Ö-zil to the Arsenal! 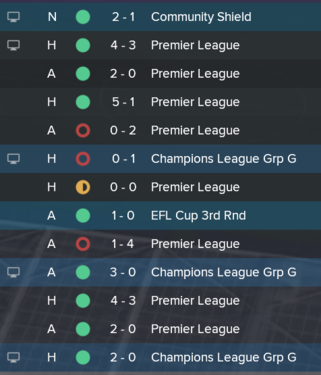 's tactics for over a year now, and my current save with Ajax has been no different, as I've adopted the 4312 shown a page or two back. In the process I learnt an important lesson about looking closely at a role to see how it plays. "Close Down More" for CM-De and no closing down modifiers on the DLP-De give the same level of closing down! I'd argue that this is completely misleading that two roles with the same mentality and the same position have different levels of closing down described the same way, but still reinforces the importance of really paying attention when setting up your tactic, so I just thought I'd share it. You can tell your DLP to close down even less. You can’t do that with a DM(D). Thats the difference - among other things. Yes, I've done that before, and obviously the passing is different (and in fact looking at that you can't give them exactly the same passing directness) and the DLP is a ball magnet, but I was mainly pointing out that just because you see "Close Down More" ticked doesn't actually mean there's a lot of closing down. ... but I was mainly pointing out that just because you see "Close Down More" ticked doesn't actually mean there's a lot of closing down. That is a good point. Everything is relative. @Ozil to the Arsenal! could you put your squad views up for sharing? What would be your ideal ppms for each position in the 4141? Morning, all. Please excuse the slow responses and lack of updates in the past week or so. Started a new project so time suddenly became tight. In-game I am ready for the next update, just need to find the time to write. Wanted to share this video as it's superb and relates very closely to the diamond used last season. Strongly suggest following this channel if you're interested in tactics. Edited August 25, 2018 by Ö-zil to the Arsenal! do i need structured shapes to make that positional play work ? i try to test how to to this kind of pass & move. positional play,mean if i want to use my winger to pin down the AI's FB. 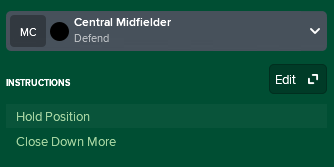 That mean my winger should not move to much. What strata do you use your wingers in? If you move them to the midfield strata and change the role to Inverted Winger or Wide Midfielder, you will see them hold the width a lot more - even in the final third. my winger is in AMRL position,W or IF. Any idea how i lock them in maximum wide position. look like if i use attacking or guanho mentality,they stay more & more wide. if control mentality,still not wide enough,not maximum enough. 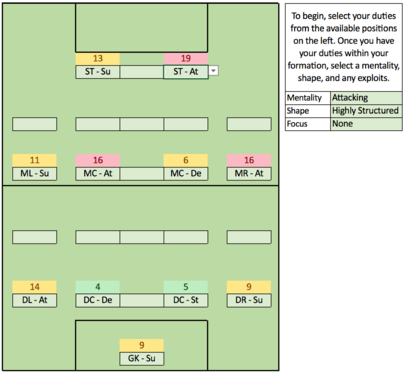 Use the wingers in the Midfield Right/Left position instead of AMRL. If you want extreme width - that being horizontal - use the Team Instruction. It makes the horizontal distance between the players bigger. But I do not know how much of a benefit this is in the match engine. Why the Roam From Position? Because Roam From Position allows the player to still look for space to attack in while still staying wide for the most part. IW (a) - Stay Wider, yes. that will be different kind of football from what i wish. i want the 2 winger stay wide in his 80%~90% of the game. stay wide at all cost,before that area. so Roam From Position for winger not what i plan. winger,forward = stay in Position,at all cost before final third. DM,FB,CD = stay in Position,at all cost in 90 min. It tells you in the game, if you go on the FFP section. I had issues when I brought Ronaldo back to Manchester which put us over wage rise limits and I remember checking there and seeing it was only a fine and thinking "worth it, its freakin' Ronaldo". Incidentally we never got fined, the PL just ignored it. I feel like the in game explanation is confusing. It makes it sound like you could lose 5 points and/or be fined for either missing the profit or exceeding the payroll. I was always worried about it, but I basically had no choice the one year. I read it differently. They give both regulations in the first two sentences. No more than £15 million loss over the previous 36 months. Year to year increase of payroll. If remaining in the same division a points deduction of 5 points for the following season. If player wage expenditure increases above allowed limits a fine of a percentage of the amount overspent will be imposed." That just reads confusing all heck honestly. It's like someone who wants to be a lawyer but isn't one wrote it to sound fancy without realizing it's confusing. Just say it simple. If you miss the profit/loss requirement you lose 5 points if you stay in the same division. If you miss the payroll, you'll be fined. Incidentally we never got fined, the PL just ignored it. Is it possible you had enough of an increase in revenue to cover the wage increase. I get that this is the Premier League rule and not FM. But what's crazy is that net transfer spend isn't used. It's players sold that counts for the offset. Example for how to skirt the rule. Assume all of your other revenue is equal. You want to increase payroll by £20 million above the allowed increase. Just sell £20 million worth of players more than the year before; and even if you buy £200 million (or a billion even) worth of other players you've met the requirement. Probably, new sponsors are announced before the end of the FFP period and it is Manchester United. We're running afoul the next season after adding Dele Alli and selling nobody whilst giving new £200k+ contracts to the likes of Rashford, but I imagine I'll avoid it as well. With your 2nd point, I might be misunderstanding, but surely if I wanted to add £20million to payroll I'd have to offload (in this save I think the allowed rise is £12m, so £8m) wages, not gain £8m transfer fees? Maybe should ask for clarification somewhere else rather than clogging up this thread as we've gone off on a real tangent here. I don't think it's necessarily off-topic. Ozil himself expressed concern about FFP. And if you are building with youth and then want to keep that youth with pay raises down the line, it's an important consideration. That being said, I'll try to clarify quickly. The salary rise, above what is allowed, can be offset by increases in revenue, not profit. This is very important. I have escaped the fines this way before. Revenue - Transfer fees received for players sold. The fees you receive can be used to offset payroll increases. If those fees drive your total revenue higher than the previous season. Profit is not a consideration. So if you have higher revenue you get the offset, even if you have lower profit. That's why I qualified it with "Assume all of your other revenue is equal." There are a few reasons for choosing to play a 4-4-2 diamond. 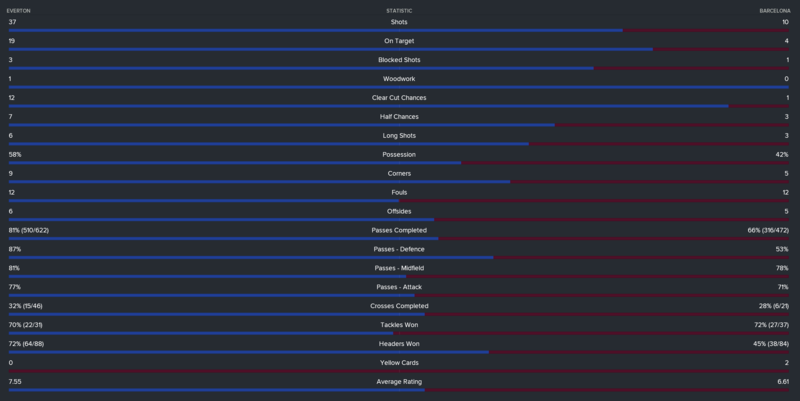 That was in the Champions League in a game we needed to win after losing the opener in the group to a much worse team because bad luck/tactic (outshot them 21-4 and lost 1-0, but only had 4 shots on goal - so it wasn't all luck). Anyway outshot Barca 37-10 and we had 12 Clear Cut chances! Only six of the shots were long shots. They were real chances too. Barca generated nothing the whole game. 10 shots, 4 on target overstates how 'well' they played. This could have been the Germany 7, Brazil 1 of FM. How we missed so many shots from point blank range is beyond me. Marc-André ter Stegen should have been rated 10.0 despite losing 2-0. I was blown away! After a good start, we were struggling, so I figured try this out for the PSV game. That's the game after 1-4 loss to Leicester of all teams. 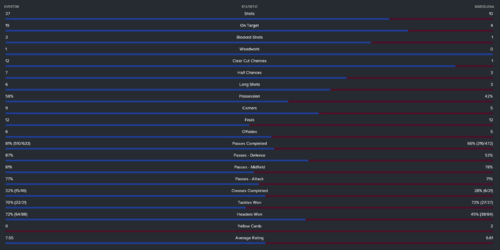 Along the way we lost to Bournemouth 0-2, the aforementioned Braga 0-1, drew with Brighton 0-0. It was time for a tweak. The D was a little shaky in the Stoke game (4-3 above), but we were up 4-1 and one of the goals was on a corner. My one observation between the senior and youth games after a few weeks is that you need big time central defenders. When I've had to play U18 CDs in U23 games, for example, we give up some goals on long balls. I also noticed some great long balls from the DC's and FB's. I guess I have the right players for this. It is super fun when everything is clicking. Thanks Ozil! I'm having issues with tutoring and players learning PPMs was hoping someone might be able to help. When I tutor players I keep getting the disappointed and gained little outcome, is there something I might be doing wrong. I'm using tutors with good personalities and determination and most of the tutees have decent personalities as well. Have been using the second option that doesn't transfer PPM's. Any ideas? With the PPMs, could this be related to the coaches or training facilities? I'm using players with good determination and PPMs which suit the players. They notes say they are progressing well and then it fails. Any tips? Any help greatly appreciated as this is really annoying me! If you need more details let me know. The disappointed thing happens regularly. I could be wrong, but I think it's more frequent when you just ask them to mentor off the pitch. I don't pay attention to it though as long as their mentals improve and hopefully their personality changes. PPM's just fail sometimes. When that happens I just try again one or two more times. I wouldn't sweat it too much. Take note of a few things when you set up tutoring. Then when it's over, note how they've changed. I've seen plenty of improvement, even when getting the "a little disappointed" email. I think it's just a not perfectly accurate email description is all. Maybe you'll notice a pattern with tutors over time. I tried to keep track of specific tutors once, but just gave up on it. Nothing glaring jumped out at me in terms of which ones had success and which didn't but maybe there is something there. I have to say, @Rashidi and @Cleon are great tactical minds and understand the mechanics of the game to an expert level, however threads like these take away some of the ‘game’ aspect and makes you look at things with a football brain rather than trying to beat a game which is a lot more fun than trawling through pages and pages of guides trying to figure out the effect of changing a certain TI or PI. The best contributor on these forums since SFraser, I’m sure these threads inspire people just as much as his did back in the day! Thank you @Ö-zil to the Arsenal! The mentality calculator is excellent, but not quite 100% accurate. I think there are too many variables to reach 100%. I recommend using it as a sanity check and double checking in-game. What’s missing? Shouldn’t be too difficult to make some changes. Been meaning to add the sweeper in there for sometime anyway. May as well update other areas while under the hood. 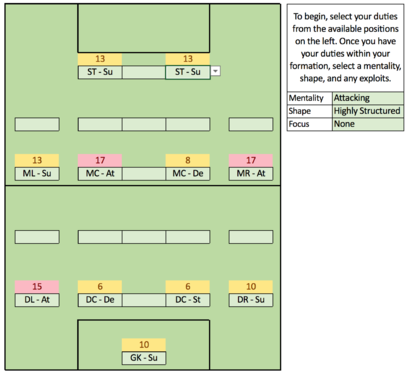 Look for overlaps - doesn't this instruction decrease the mentality of the M R/L and AM R/L while also increasing the mentality of the fullbacks/wingbacks? It does. Currently working on a new version to include this. It's time-consuming. Having to manually enter thousands of values one-by-one, but hopefully I can get something out by the end of the weekend. Ok, no rush. I was just curious if that was still true. Thank you, @BnadnerB. SFraser was certainly inspirational to me and his work remains a go-to resource to this day. Adding the slight increase to individual mentalities across the team when there is no Attack duty. As @yonko mentioned, Look for Overlaps. Ping me a message as you're updating and I'll have a play around and see if there's anything else! It already does point 1 if you're using the web version? See attached images. I completed point 2 last night, but need to do some testing this morning as it was quite later so need to make sure I've not broken anything else. Hopefully should have it up later today. What effect does the shout has when you dont use any wingers? The same? Self explanatory no? It doesn't work if you don't have wide players. Unless you mean different roles? Then yes it works with all wide players. sorry if i missed this while reading your posts. but what ppm training do you give your cm? cd? fb? rm/lm? cf? dm? etc. looked like play 1-2's for your cm roles, but i didn't want to assume to much. Hello, everybody. Please excuse the lack of updates on this. I am actually still playing - and loving - this save, albeit with very little time to contribute to the thread. Depending on people's interest in an FM18 tactical update, I could potentially do another update on a set of particularly enjoyable 4-3-3s I've been using however they won't be applicable to FM2019 players as I understand Overload has been removed from the game. Out of interest - has anyone checked out the Benfica academy in the new game? I'd be interested to see if they've maintained the talent & potential.